A preliminary hearing has been set for Wednesday, October 10, in the Dakota C. Moore first degree murder case. Online court records indicate the hearing will take place in the second floor courtroom in Galena. 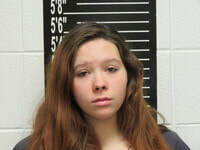 Moore, formerly of Crane, is accused of first degree murder in the death of her 9 month old child in September 2017. She was initially charged with involuntary manslaughter and abuse of a child resulting in death. A special prosecutor was assigned to the case due to a conflict of interest within the Stone County Prosecuting Attorney’s Office. Amy Fite, Prosecuting Attorney for Christian County, filed first degree murder charges against Moore on May 9, 2018. Additional information from an autopsy of the child allegedly revealed damage that was beyond the scope of an accidental injury that was initially claimed. A medical examiner determined the cause of death to be homicide. Further, the state alleges that Moore committed the crimes of first degree domestic assault and child abuse by causing the victim’s ribs to break, leading to serious physical injury.